On 14th May 2009 I reported the sale of the 48.75m motor yacht Primadonna and now I learn that she’s back on the market with Merle Wood and John Cohen at Merle Wood & Associates, renamed VF-15. Delivered by Christensen in 2009, VF-15 is the forerunner of the popular 160 series from the yard and is ABS classed and MCA compliant. Her sleek exterior styling, executed by the highly experienced in-house Christensen design & engineering team combined with an interior décor by Carol Williamson & Associates, have created a world class ocean going motor yacht. 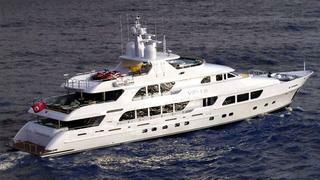 This impressive ‘helicopter ready’ yacht is now available for sale asking $29.95 million.